Tatoosh Range located in Mount Rainier National Park and the adjacent Tatoosh Wilderness, view from Paradise. Where in the United States is Washington state? Location map of the State of Washington in the US. The State of Washington is the northwestern-most state in US mainland. 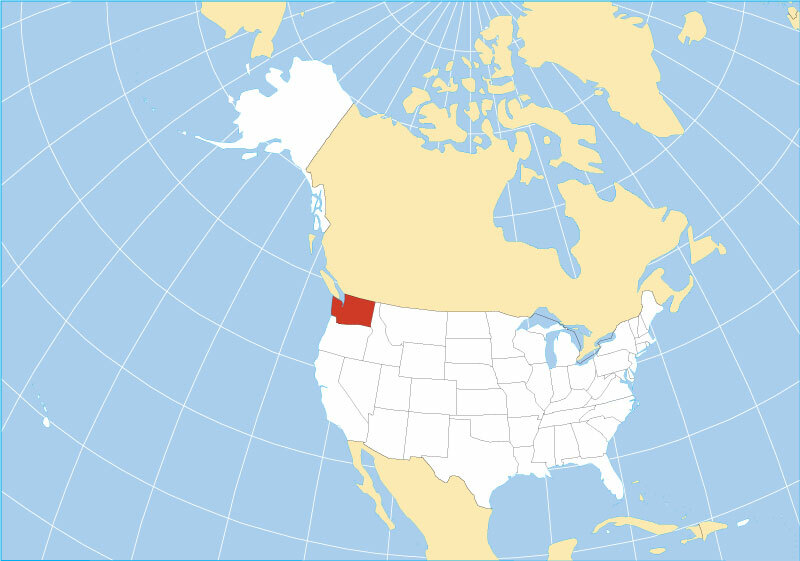 It is bordered in north by Canada (province of British Columbia) for the most part along the 49th parallel north, by Idaho in east, and the Pacific Ocean in west. The Columbia River defines a long section of the state line with Oregon in south. Washington state consists of 39 counties. The United States acquired the area of Washington through a treaty with Great Britain in 1846. Washington Territory was organized from part of Oregon Territory on 2nd March 1853; it included all of present-day Washington, northern Idaho, and northwestern Montana. The State of Washington covers an area of 184,661 km² (71,298 sq mi) , making it slightly larger than half the size of Germany, or slightly smaller than half the size of Japan. Washington state has several distinct geographical regions: there is the serrated Pacific coastline with the Strait of Juan de Fuca, the Salish Sea's outlet to the Pacific Ocean, several other bays and straits, like the Strait of Georgia, the Bellingham Bay, the Admiralty Inlet, and the Samish Bay, the Puget Sound along the northwestern coast of the state, an inlet of the Pacific Ocean, within the sound are fifty plus islands, the largest are Whidbey, Orcas, San Juan, Fidalgo, and Camano. Cool, Chocolate, North Guardian and Dusty Glaciers (left to right) on the east slopes of Glacier Peak (Dakobed), the stratovolcano in Washington State. 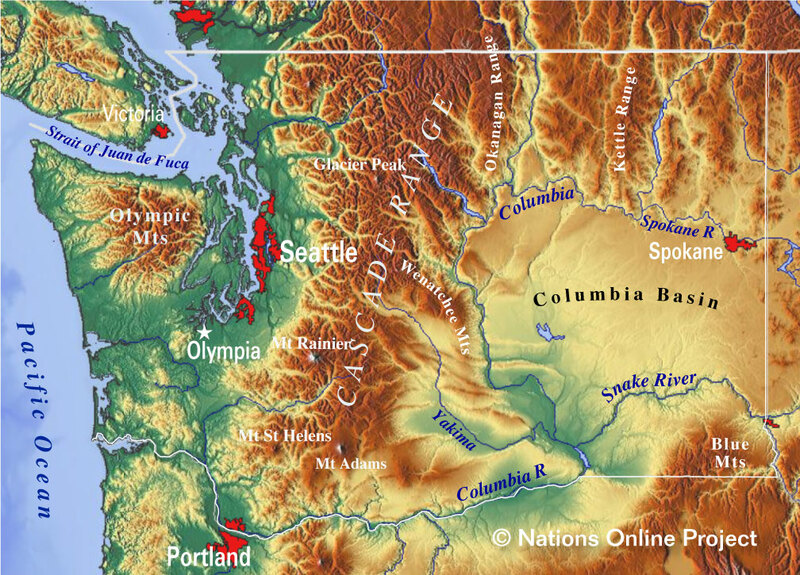 The Cascade Mountain Range divides the state into two parts – in the more hilly to mountainous Western Washington and Eastern Washington with the semiarid basalt plain of the Columbia Plateau. Within the range are five major volcanoes, from north to south: Mount Baker, an active glaciated stratovolcano at 3,286 m (10,781 ft), Glacier Peak (Dakobed), one of the most active volcano in the state with an elevation of 3,207 m (10,525 ft), dangerous Mount Rainier, the huge active stratovolcano is the highest mountain in the state at an elevation of 4,392 m (14,411 ft). Mount St. Helens, known for its major 1980 eruption, declared the most disastrous volcanic eruption in United States history. 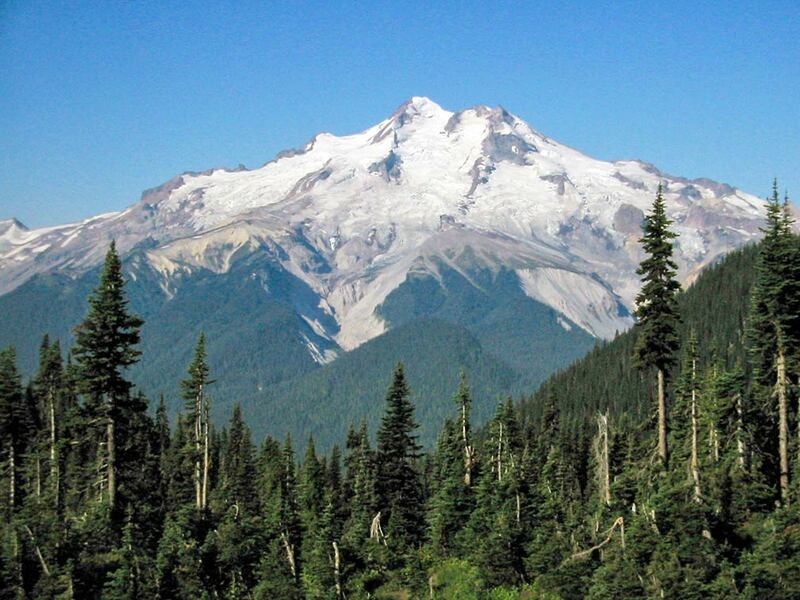 Mount Adams, a potentially active stratovolcano has not erupted in more than 1,000 years. The Wenatchee Mountains in the center of the state are a major subrange of the Cascade Range. 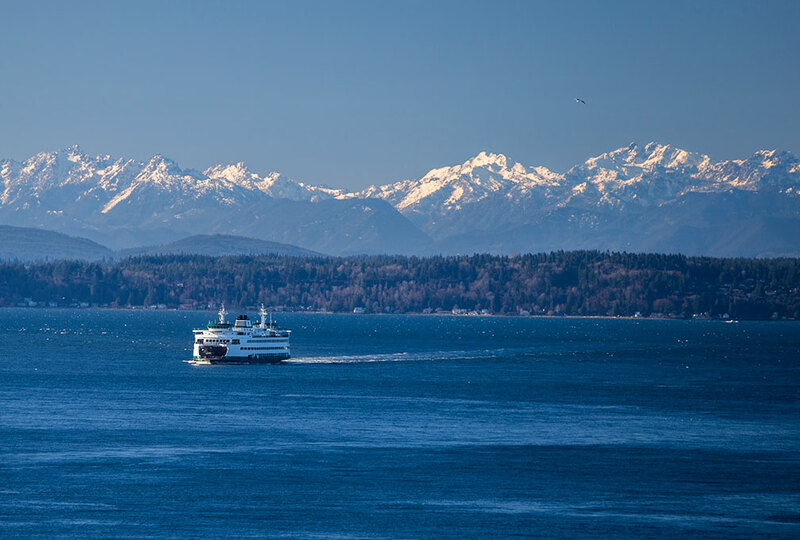 Bainbridge Island Ferry on Puget Sound with Olympic Mountain Range in background. 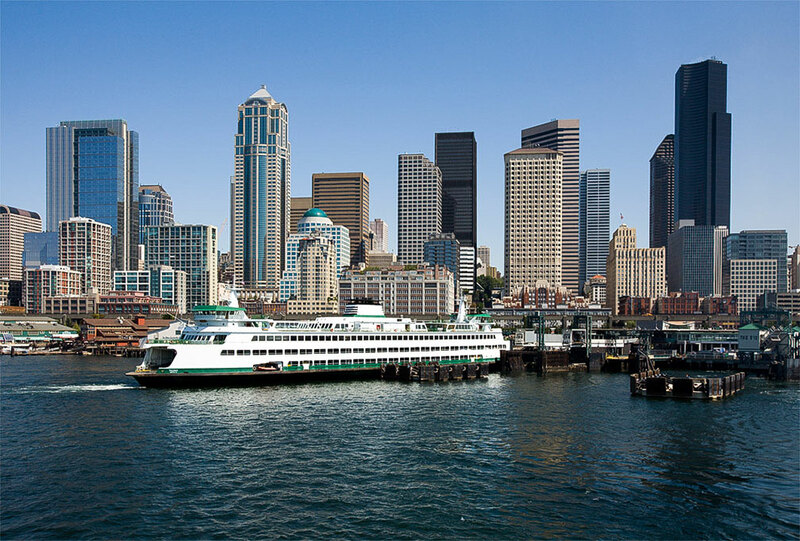 Washington has the largest ferry system in the United States with 20 terminals located around Puget Sound and in the San Juan Islands. Grande Ronde River, a tributary of the Snake River, its mouth is in Washington, Kettle River, a Columbia River tributary, its mouth is in northeastern Washington; Palouse River, a tributary of the Snake River; Crab Creek, a stream in the Columbia Basin; Pend Oreille River, a tributary of the Columbia River. View of Lake Crescent in Olympic National Park, seen from Pyramid Peak. The largest lakes in Washington state: Roosevelt Lake (Lake Roosevelt), a reservoir behind Grand Coulee Dam at the Columbia River is the largest lake in Washington state by area; Lake Chelan, the narrow fjord like lake is 50 mi (80 km) long, it is the largest natural lake in the state and a popular tourist destination; Lake Washington, a large freshwater lake near Seattle. Potholes Reservoir, part of the Columbia Basin Irrigation Project, fed by water from Moses Lake, a lake and reservoir along the course of Crab Creek; Banks Lake, a 45 km (28 mi) long reservoir, also part of the Columbia Basin Irrigation Project; Ross Lake, a large reservoir in the North Cascade mountains; Ozette Lake, is largest unaltered natural lake in Washington state. 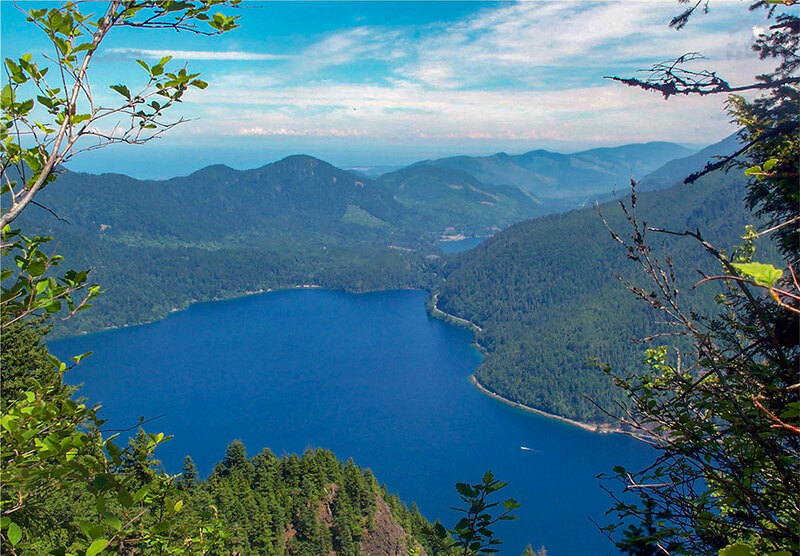 Lake Crescent, a deep lake located within Olympic National Park. 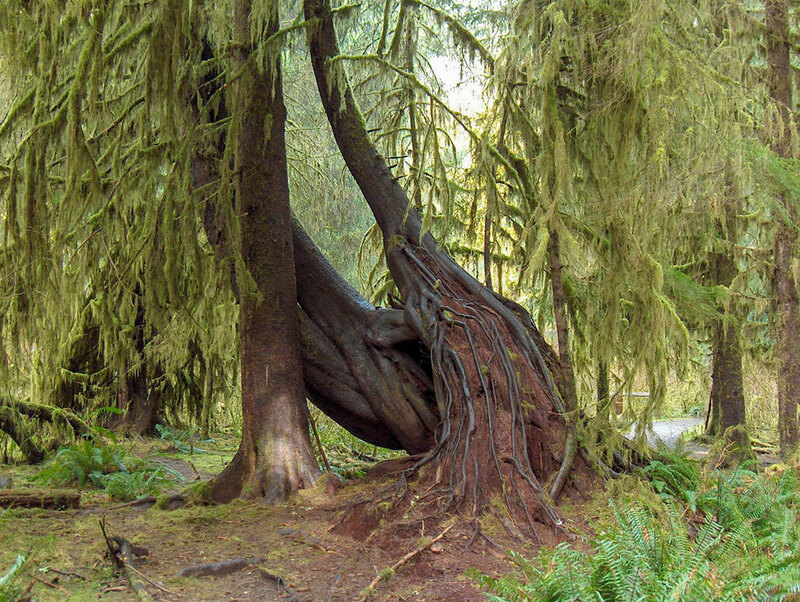 Primeval forest in Hoh Rain Forest in the Olympic National Park, a UNESCO World Heritage Site. Olympic National Park on the Olympic Peninsula offers the longest undeveloped wilderness coastline in the contiguous United States. To the east of the coast rise the Olympic Mountains, part of the Pacific Coast Ranges, glacier-clad, steep-sided peaks within a vast intact old growth forest, interspersed with alpine meadows. Eleven major rivers radiate outwards to all sides from the mountain range and drain the Olympics. Highest peak is Mount Olympus at 2,432 m (7,980 ft). UNESCO designated the Olympic National Park as an International Biosphere Reserve in 1976, and in 1981 as a World Heritage Site. 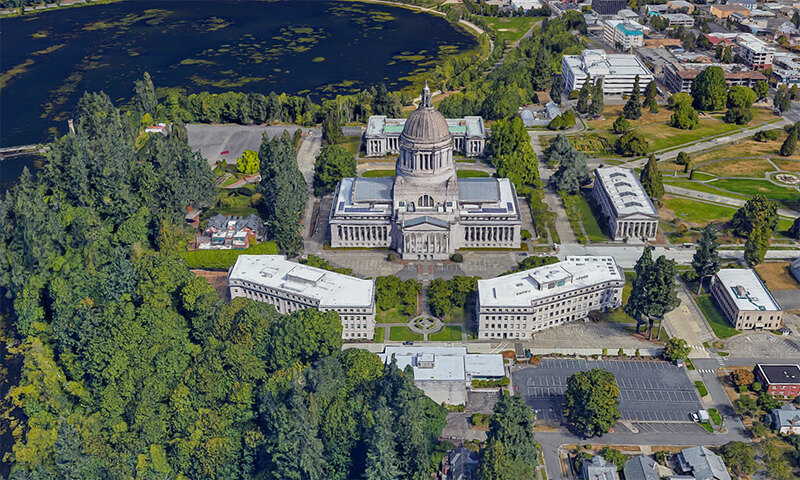 Rendered image of the Washington State Capitol building in Olympia, the state's capital city. The Legislative Building houses the government of Washington State. Washington state has a population of 7.4 million people (2018 est.) ; capital city is Olympia, largest city is Seattle, largest metropolitan area is Metro Seattle (pop. 3.8 million in 2017). Other major cities are Spokane, Tacoma, Vancouver (WA), Bellevue, Kent, and Everett. By far the largest airport in the state is Seattle–Tacoma International Airport (IATA code: SEA), other major airports are Spokane International Airport (Geiger Field; IATA code: GEG), Bellingham International Airport (IATA code: BLI), and Tri-Cities Airport in Pasco (IATA code: PSC). Downtown Seattle, largest city in Washington State, Bainbridge Island ferry in foreground. Other cities and towns in Washington: Aberdeen, Anacortes, Battle Ground, Bellingham, Blaine, Bremerton, Camas, Centralia, Chehalis, Chelan, Cheney, Clarkston, Colfax, Colville, Coulee City, Dayton, Ellensburg, Enumclaw, Ephrata, Federal Way, Forks, Goldendale, Grand Coulee, Hoquiam, Kelso, Kennewick, Lacey, Lakewood, Longview, Lynnwood, Marysville, Morton, Moses Lake, Mount Vernon, Newport, Oak Harbor, Omak, Oroville, Othello, PascoIlwaco, Port Angeles, Pullman, Puyallup, Quincy, Raymond, Redmond, Renton, Republic, Richland, Ritzville, Seattle, South Bend, Spokane Valley, Toppenish, Walla Walla, Wenatchee, Wilbur, Winthrop, and Yakima. 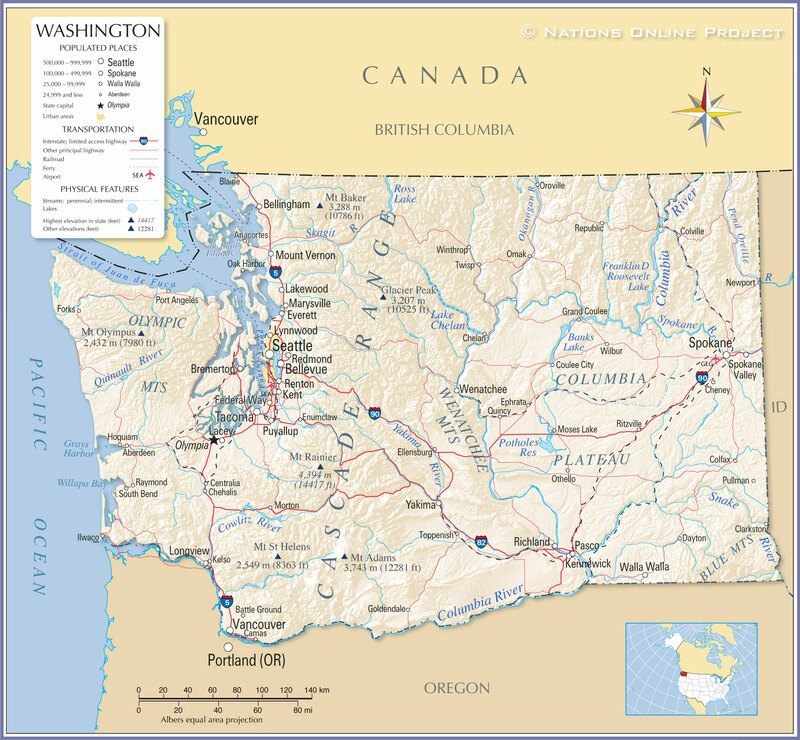 The detailed map is showing the US state of State of Washington with boundaries, the location of the state capital Olympia, major cities and populated places, streams and lakes, interstate highways, principal highways, and railroads.